Kenya - IOM has launched a six-month nationwide public information campaign to combat human trafficking in Kenya. The campaign, which uses the slogan "People are Not for Sale. Beware of Human Trafficking," is funded by Norway and Canada and will be implemented in partnership with the government, media and local NGO partners. "The campaign will include a series of three-minute infomercials broadcast in Kiswahili, the national language, before four prime time news bulletins on Kenya Broadcasting Service," says IOM Kenya Counter-Trafficking Programme Officer Alice Kimani. "National television will also televise a court drama on human trafficking in its popular Vioja Mahakamani programme. And IOM will get other TV and radio spots where listeners can call in and ask questions about human trafficking," she adds. The campaign will also work with NGO and other partners to develop and distribute Information, Education and Communication (IEC) materials, organize stakeholder forums and train government counterparts to raise public awareness and encourage people to report cases of human trafficking. IOM is also helping the Ministry of Labour to set up a website, where counter-trafficking information will be posted. The website will offer advice to potential labour migrants on how to avoid becoming victims of trafficking and details of whom to contact if they become involved with traffickers. Kenya is a source, transit and destination country for human trafficking. People are trafficked both internally and internationally. 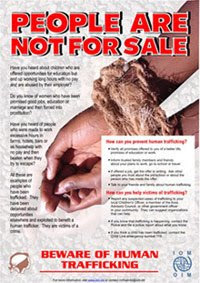 Internal trafficking is mostly from rural to urban areas for domestic work, sexual exploitation and agricultural work. International trafficking destinations include Germany, the Netherlands, the United Kingdom, the United States of America, the United Arab Emirates and Saudi Arabia, mostly for domestic work and sexual exploitation. Girls are also trafficked to Kenya from Rwanda, Uganda, Ethiopia, the Democratic Republic of the Congo and Burundi for sexual exploitation and from Tanzania for agricultural and domestic work. Trafficking victims from South East Asia, Pakistan and Ethiopia transit through Kenya en route to South Africa and Europe.